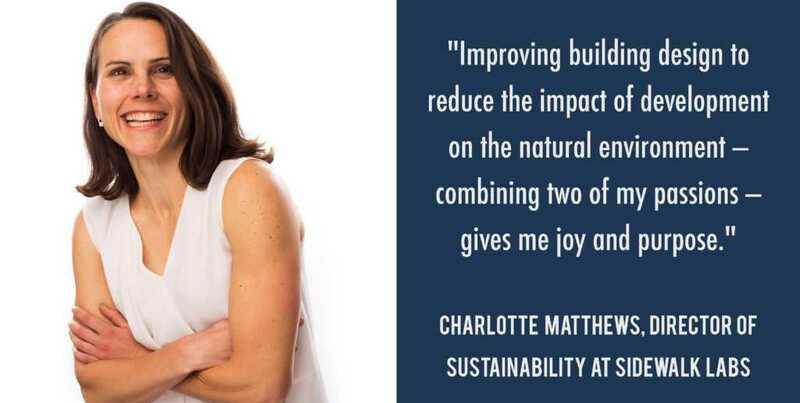 Meet Charlotte Matthews, Director of Sustainability at Sidewalk Labs and IMT board member. I love buildings—their architecture and design. In college, I realized that protecting the health of the environment—the air, water, and habitats on which life and economies depend—would be the defining mission for my life. Combining those two passions—improving building design to reduce the impact of development on the natural environment—gives me joy and purpose. Getting the microgrid at Hudson Yards financed and into construction was the hardest and biggest thing I’ve accomplished in my career. But, what I am most proud of is the small contribution I’ve made to the larger building performance movement. Every budget constraint, technology risk, or challenging stakeholder that a project team overcomes to deliver a better-performing building sets a new floor for what people expect (and thus demand) of buildings moving forward. I have been a part of that progress. I believe the collection and study of data, systems integration, and automation will enable buildings to perform much more effectively and efficiently than they do today. The real estate industry is really only just getting started in this space. In a few years, I hope that the work we are doing at Sidewalk Labs will prove out what is possible in the built environment in terms of livability, affordability, and environmental sustainability while getting people excited to dare innovation and readily adopt new technologies. We need to speed up the pace of change and progress in building design, construction, and operation. When I was asked this question several years ago, I suggested listening—everyone can teach you something—and speaking up when you disagreed. While I would still encourage that, what feels most important to me now is that women believe in their capabilities and help one another pursue ambitious positions of leadership and impact. The world—both men and women—does not yet recognize the potential in women to lead and deliver large projects as readily as it does men, and connecting capable women to those opportunities requires a concerted push from everyone.